Peter has been delivering amazing, fresh produce to locals in the Margaree, Cheticamp and Inverness area since 2008. His recent addition of a greenhouse has made for a lot of happy customers. A lot of people subscribe to his ‘CSA baskets’. With this system you pay a flat fee at the beginning of the season and you get a weekly delivery of fresh vegetables from June until October. And if you are just passing through or want to grab only a few things, you can find his great produce at the Baddeck famers market on Wednesdays from 10am until noon starting mid June until the end of October and at the Cheticamp farmers market on Saturdays from 10am until 1pm from in July and August. The Cape Breton Food Hub is another way to get produce from Peter's farm. This is an excellent delivery system that supplies to all corners of the island from all kinds of different vendors. A variety of restaurants also use his produce and the Margaree Co-op oftentimes carries a good selection of his vegetables. Peter has a huge personality and is well know in the community. His ‘Front Porch Farm’ is a very well organized, yet has a laid back atmosphere. 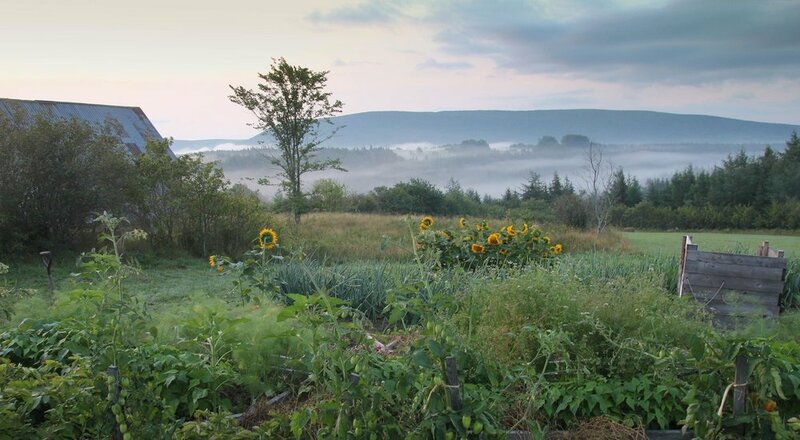 Hosting a lot of international travelers through ‘WWOOFing’, has added an interesting little microculture to the quiet Margaree valley. If you are curious about his produce or you might want to spend some time working on a farm, take a look at his website at www.frontporchfarm.ca or follow him on Instagram or Facebook.